What is ozone? 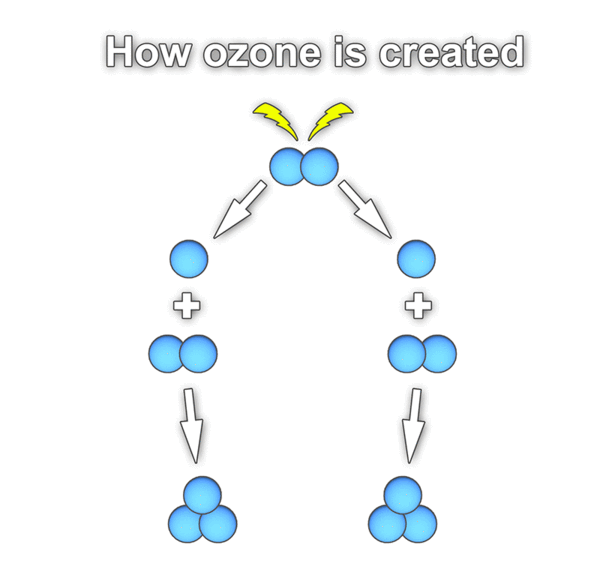 How is ozone created? How does it work? About fifteen miles above the earth there is a layer of ozone. It protects us from UV rays. It is created when short wave UV rays break down the oxygen molecules into single molecules of oxygen. These molecules are unstable and attach themselves to O 2 molecules creating O 3 or ozone. On the surface of the earth, ozone is created by lightning passing through the air. The electrical charge from the lightning breaks up O 2 into single molecules. These again attach themselves to O 2 molecules and become ozone. Why is this important to odor removal? The ozone will seek out molecules to attach to that are receptive of the extra molecule of oxygen. These molecules of odors will allow the oxygen molecule to attach to them changing the molecule to an odorless molecule. This process does not mask odors or leave more potent odor to cover, it completely changes and eliminates odors naturally and safely. Ah, there’s that great fresh smell you get right after a lighting storm. That smell is ozone and it works as nature’s air purifier. When electricity passes through the air, some of the O2 oxygen molecules split into single oxygen atoms that will temporary bond with O2 molecules to form O3 molecules or ozone. These ozone molecules are unstable. One of the oxygen atoms is released to bond with other receptive molecules, for example, molecules associated with odors of smoke or organic decay. This chemical reaction is called oxidation and it changes the receptive molecules into new odorless molecules. If the O3 molecules can’t find other receptive molecules with which to bond, they quickly revert back to their most stable state which is pure oxygen. Ozone has a relatively short half-life transitioning back to oxygen at a rate of fifty percent every half an hour. So, even at high concentrations, ozone reverts to safe levels quickly. Now that we know what ozone is and how it can effectively and safely remove odors, how do we go about producing it? There are two ways that ozone is commercially generated UV light and corona discharge. UV light generators produce less ozone and are less effective at neutralizing odors. Corona discharge, on the other hand, is the preferred way of generating ozone for odor removal and sanitization. We’ve designed the Ozogen ten kV generator with a more robust corona discharge system that creates six times the ozone of comparative sized and priced ozone generators. The higher output of the Ozogen ten kV makes it extremely effective at removing tough odors like smoke, water damage, pets, and in the case of forensic restoration, necrosis. Designed and assembled in the United States with highest quality parts, the Ozogen ten kV is the only ozone generator available that’s maintenance free and carries a lifetime warranty. The Ozogen team at Ram Air International is passionate about ozone effectiveness at sanitization and eradication of unwanted odors. From time to time, every home experiences odors. Odors from pets, cooking, people, outside influences, water damage, fire damage, and more. Odors that are treated with over-the-counter products most of the time just mask the odor with perfumes or mist and they don't remove the odor. Organic odors will still be there and will return when the over-the-counter products have lost their strength. Sho Me Cleans has a three-pronged defense to eliminating odors in you home or business.We are trained in the removal of odors not just masking the odors. Sho Me Clean starts with carpet cleaning not just to remove the dirt but remove the odor causing elements in your carpet. Steam cleaning your carpets is the number one recommended cleaning process by most major manufactures. Not only do we clean the carpets, we remove the dirt and odors via our truck mount system the El Diablo, one the most powerful truck mounts in the industry and the most powerful truck mount in its size. Although the machine makes it easier, you still need to use the correct solutions. We use solutions that simply are the best in the carpet cleaning industry. 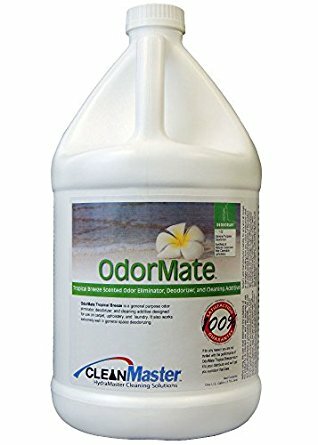 Best at cleaning, best at removal of odors, and best at being safe for you and your family. Next, we can clean your HVAC system. Often this part of your home or business is overlooked when it comes to eliminating odors. We remove dirt and debris in your duct work that absorbs and retains odors. 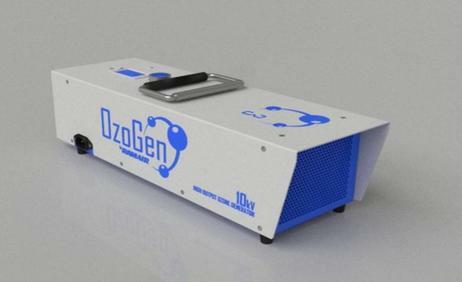 Last, we have ozone generator that will attack the odor on a molecular level. This process allows us to change the odor causing molecules into new molecules that do not have odor. This leaves you with clean fresh smell and a clean fresh environment to live and work. This is the earth’s ozone layer; it protects us from harmful UV rays. But, what is ozone? How is it created? How does it work? To answer these questions, we’ll be going down to about fifteen miles above the surface of the earth to the stratosphere. The ozone layer is created when short waive UV radiation from the sun breaks down O2 oxygen molecules in the lower stratosphere. The resulting O1 molecules are unstable and attach themselves to O2 oxygen molecules to create O3 or ozone. The ozone layer doesn’t stop all UV radiation that’s why we still need sun screen, but without it life on earth as we know it would not exist.